On Christmas Eve my neighbor, Betty Miramontes of Puerto Vallarta’s Business Association, told me about a Humpback that got entangled in fish nets and couldn’t be saved. She said they needed help getting the word out how to better protect our beloved whales in beautiful Banderas Bay. 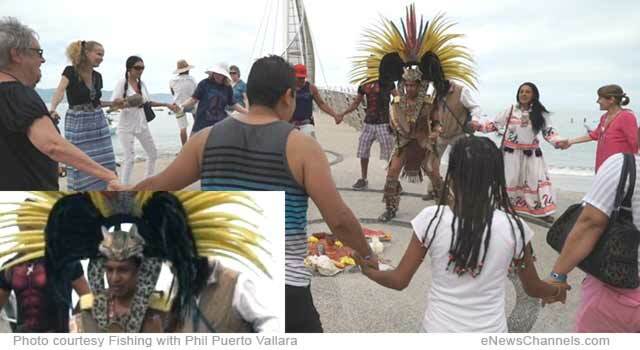 So I organized a Whale protection ceremony at 10 am on Feb 5 on Los Muertos Pier, led by Azteca-Huichol shaman Mexica (Ricardo Hernandez Lugo) and Mayte Quiroz Parra, to compassionately protect our Humpbacks both practically and spiritually through public awareness and interfaith harmony. We were also inspired by the United Nations creating Interfaith Harmony Week Feb 1-7, proposed by H.M. King Abdullah II of Jordan in 2010. http://worldinterfaithharmonyweek.com/. COVER PHOTO (above): Photo courtesy Fishing with Phil Puerto Vallarta. Azteca shaman Mexica and Mayte led 25 whale lovers on Los Muertos Pier in singing love songs to the whales to compassionately protect them. Soon 10 whales spouted and frolicked in appreciation! (L-R) American organizer Olympian Suzy Chaffee (Catholic), Mexican Alicia Partida (R-L)English shaman Gayle Weatherly and Cherokee fisherman co-host Phil Kerr. 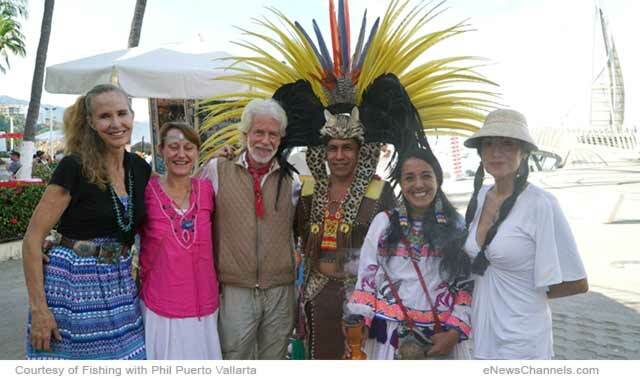 The event was co-hosted by Phil Kerr (Cherokee) of Fishing with Phil Puerto Vallarta, and included my other local spiritual friends: Gayle Weatherly, English shaman-healer; Alicia Partida, Botanical Garden organizer of PV’s Annual Bougainvillea Festival; Ray Dion of Promovisionpv.com, and Phil’s whale tour friends. While Mayte created an altar in the center of our circle with our offerings, we were spontaneously joined by around 21 other whale lovers of multi-faiths and cultures. She purified everyone with the smoke of copal pitch, as frankincense and myrrh do, possibly why the Three Wise Men presented them to Jesus. Mexica then led us in love songs and prayers to the whales, ocean and Mother Earth, which we both explained raises their vibration, which purifies the water and heals and protects them all, so our 65 40-ton Humpbacks keep coming back here to happily mate and give birth to about 30 babies each winter. 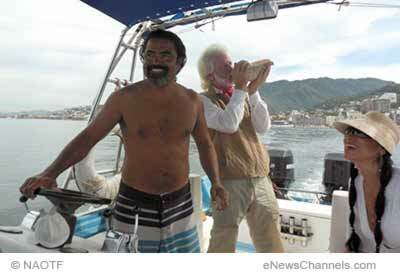 PHOTO CAPTION (above): (L) Our Whale offering ceremony included Gayle, Suzy, Mexica, Alicia, Mayte, Phil. © NAOTF.org. PHOTO CAPTION (above): (L)Captain Lorenzo Rivera, Phil blowing conch to send our prayers to the heavens and whales, and Alicia. © NAOTF. Thanks to Mexica’s friend Captain Lorenzo Rivera, our core group got to also do a sea ceremony with spiritual offerings. Gayle blessed the whale that gave its life to raise our awareness to protect her pod family. She also thanked the earth’s whales for traveling along the ocean’s gridlines while singing, which raises the vibration of Mother Earth and Her oceans, further harmed from Fukushima’s radiation leaks. I also thanked the mighty Neptune and his angelic nature spirits. Phil then blew the conch to send our prayers to the heavens and whales and Gayle chimed her crystal bowl which also clears the water. 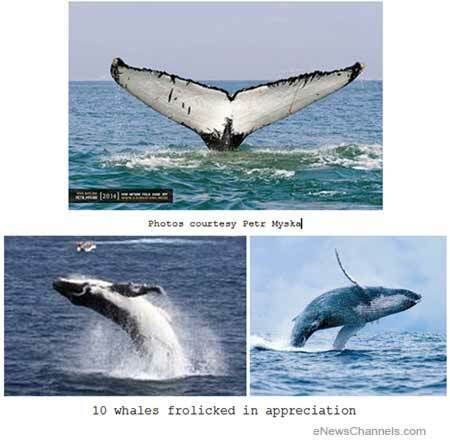 PHOTO CAPTION (above): Photos courtesy Petr Myska – 10 whales frolicked in appreciation. Suddenly three schools of dolphins escorted us back and then Captain Lorenzo yelled, “There she blows,” pointing to about 10 whales spouting and frolicking near the pier. Mexica confirmed that the whales wanted to bask in our love energy and purified water for the health of their babies, supported by these revelations: Chemicals in plastic linked to rise in obesity and diabetes – … in infants since they have no resistance to them. Could that be why a baby whale just washed up in Punta Mita? https://www.facebook.com/aztecanayarit?pnref=story . Since plastics thrown on the streets break up into tiny pieces that whales and fish (we eat) can’t help ingesting, PLEASE recycle plastics, and use cloth shopping bags, glass baby bottles or best Mothers’ breasts! Given a 19-Year-Old Develops Ocean Cleanup Array That Could Remove … 7.2 million tons of plastics to save his generation, let’s do our part to get Vallarta beautifully healthy. A daughter of a fellow Zumba mom loved the idea that we should tell everyone to imagine every time you recycle a bottle or bag, a baby whale or fish jumps for joy! Olivia Ellis (Cherokee) PhD, my gifted advisor, had told me three times how important it is to do this ceremony and not let this moment slip away to help restore our suffering oceans. Japan’s late great “water guru,” Dr. Masura Emoto, proved this phenomenon through compassionately leading hundreds of communities worldwide often with the Indigenous, to restore their contaminated waters. Everyone wants to continue these oceandances that “feed the soul,” weekly, hosted by alternating hotels across the bay. It will be a fun fitness part of our Vallarta Saludable’s (VS) holistic plan to prevent a collapse in Vallarta (and Mexico’s) healthcare system from diabetes. “Since Mother Nature is the great healer, the Aztecas and Huichols will also lead Eco Tours on our ‘Legendary Azteca Trade Routes,’ said eco tourism leader Carlos VonHauske, my VS co-founder. The main way that our innovative multi-cultural team is working with Vallarta’s Secretary of Health to compassionately restore the vibrant health of Vallartans is by introducing yummy U.S. stevias, stevia sodas and organic food to their diet, including plantinng organic gardens next to hospitals. Plus nano technology that reverses the need for dialysis and prevents amputations. One of our doctors was scheduled to join our sea ceremony; instead, his act of compassion was tending to an emergency patient in the middle of the night since our IMSS hospital was too overwhelmed with diabetes cases to help her then or even the next day. Mayan leaders have said that the most powerful way to purify and heal Mother Earth and Her oceans and mountains, are through these kinds of harmonious multi-faith ceremonies. Here is how Native American Elders-led Gratitude Snowdances, which our NAOTF helps inspire, have helped end US droughts for 55 years including 2012’s: Snow Job: Ski Resorts Call On – WSJ. Pharrell Williams (of “Happy”) and U.S. Vice President Al Gore announced that on June 18, two billion people on seven continents will be “harmonizing” during their televised Earth Concert. Hopefully they will includes these kinds of inspiring multi-faith love songs to Mother Earth and Her oceans, including by local Carlos Santana, on: . Our whale ceremony was a great lesson in trusting that Creator is in charge and events can turn out even better than planned. When a boat wasn’t immediately available, the circle dance spontaneously came together. Amazing things can happen when people of diverse faiths join together and express gratitude to Nature in our unique ways, and in so doing to each other. Vallarta Adventures also compassionately teaches visitors how to protect the whales along with ECOBAC: The Humpback Whale Protection Program Continues in Puerto … And here is a preview of Phil’s documentary to help spread this healing of our beloved oceans and babies. Hail to Karen Armstrong, founder of the Charter for Compassion, for helping Earth rise through spreading this spirit to millions who are more happily and consciously living by the Golden Rule, including here in Paradise! Many blessings, Dios te bendiga (God blesses you), Nameste, “Mitakuye Oyasin” (All My Relations), God is Great…! 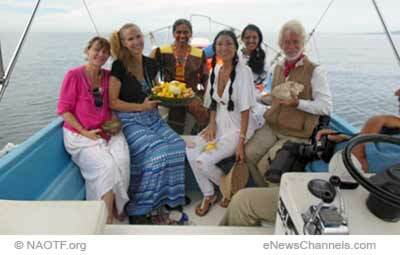 PHOTO CAPTION (above): (L)Our Whale ceremony team: Suzy, Gayle, Phil, Mexica, Mayte and Alicia. Courtesy of Fishing with Phil Puerto Vallarta. Mine eyes have seen the glory of the healing of the Earth. We’ll do it for our children and strive for all we’re worth. Glory glory hallelujah, Joy of Earth is given to us! Glory, glory hallelujah, Let’s heal the Earth today! The stopping of the drilling, that makes our Mother bleed. Let’s heal the SEA today!